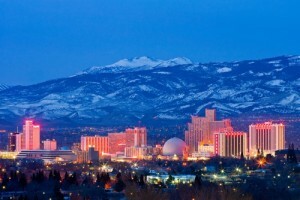 With outdoor attractions such as Truckee River Whitewater Park, which offers skiing/snowboarding in the winter and rafting/kayaking in the summer, Reno welcomes thousands of tourists each year. Whether it’s a casual stroll through West Street Market or experiencing an inspiring performance by the Reno Philharmonic, this big little city creates for an enjoyable and engaging atmosphere. While Reno is home to the National Automobile Museum and the Nevada Museum of Art, this fun loving city doesn’t stop when the night arrives. Some could even argue the adventures begin when the sun goes down, for adults at least. Reno sports many exciting clubs and casinos from the thrilling 1up club to the Aura Ultra Lounge featured in Silver Legacy Hotel and Casino and even Eldorado Hotel and Casino’s nightspot Novi. However, this celebrated nightlife is not the only aspect that makes Reno’s economy a thriving one. According to The Wall Street Journal, approximately 100 companies have located or expanded in Reno with more than 10,000 new jobs in 2015. Because the city extended its economic revenue from the casino industry to healthcare, startups, and technological-based companies, it has allowed for more opportunities for this manufacturing hub of an area. Ranked as the country’s “most consistent standout” nationally by the Kauffman Foundation, Reno continues to be a perfect place for entrepreneurial startups. With a Tier 1 University and the cost of living being lower than the national average, according to Forbes, startups such as Zero 8 Studios and Bombora prosper in an active community that encourages eager entrepreneurs. Funded by the City of Reno, Reno Accelerator Fund is a project that makes investments in Reno’s most promising early stage startups. With this type of time and effort into Reno’s economy and community, Reno has provided a positive impact on the growing businesses. While still promoting the exciting culture Reno has to offer, the slight shift from poker tables and nightclubs to street areas named Startup Row proves to be a smart move for Reno’s economic redevelopment. If you’re interested in having a local phone number for the Reno area, click here. This entry was posted in Local phone numbers by Kathryn Anderson. Bookmark the permalink.